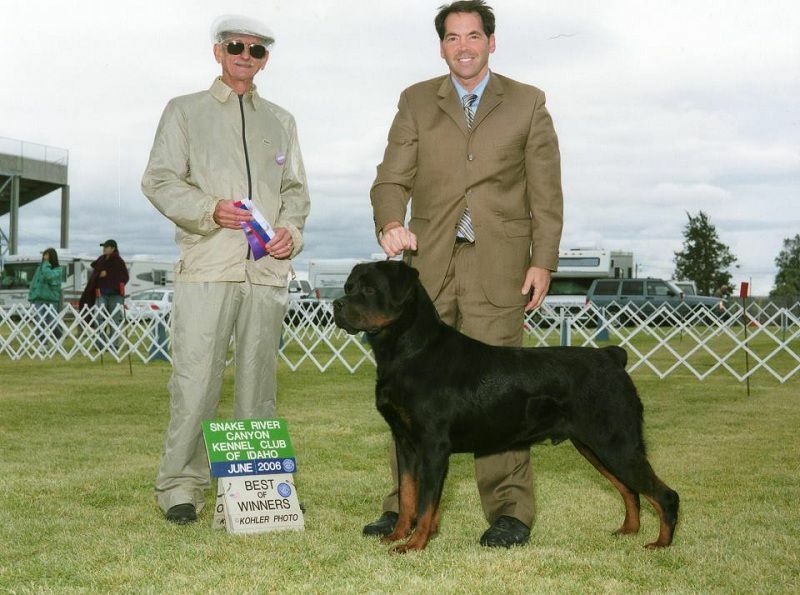 In 2015, Jerry, with the commitment to the same fundamental principles and philosophies of breeding, became the sole owner and operator of the Von Warterr Rottweiler kennel while Warren still serves as an ongoing advisor. The goal of the Von Warterr Rottweiler breeding program is to create a show quality Rottweiler who is sound in temperament, beautiful in type, healthy in genetics, correct in structure, strong in drives, intelligent in mind and proven pedigree. Correct: meaning the dog is in accordance with the breed standard in type, structure, size, cosmetics, and temperament. Confident: meaning the dog knows its capabilities and is sure of itself. Therefore it is not shy or nervous which would cause it to be a “fear biter”. Courageous: meaning the dog has the inner constitution to perform its purpose of protecting in threatening situations. He will not tuck his tail and run but will engage an attacker and has the drive to remain engaged even through pain in order to protect. Cerebral: meaning the dog has the intelligence to perceive what is a real threat and what is not. The dog is not full of out of control aggression and therefore a risk to anyone and everyone. He has a proverbial “on” and “off” switch. The dog can take down a threatening person if needed but the dog can also calmly and safely watch security over children.